We can't stop watching this old video of Tyler getting choke slammed at a Gucci show. Most work days begin with a phone call from Nathan, a quick session on today’s attempt to dominate the internet. When I picked up his call this morning there was mostly dead air with muffled voices from what sounded like a video, whatever he was watching had his full attention. 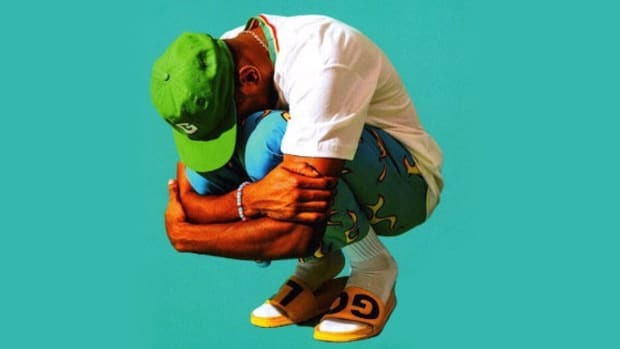 When he finally remembered I was on the phone I had to inquire what he was watching, I wasn’t ready for him to say, “Tyler The Creator getting thrown off stage at a Gucci Mane show.” It sounded like pure madness. Tyler and Gucci in the same room would be mixing fire, oil and ice cream cones and putting them on the same stage. I’m surprised only one body was thrown. He sent me the video clip and what I saw was far beyond anything could’ve imagined. Nathan and I didn’t just watch it and laugh, for 30 minutes we studied the clip how lawyers study cases, breaking down every scene like an episode of The Wire, completely immersed ourselves in this three-year-old video. This is the breakdown, even if you watched it before, I’m certain you didn’t catch everything that transpired. 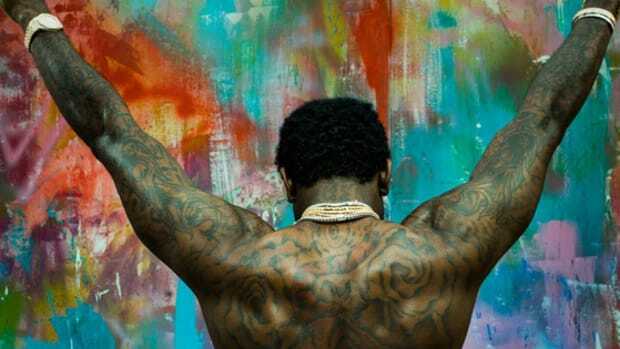 The video begins with Gucci Mane on stage beginning to perform his 2009 hit, "Photoshoot." That’s a song that to this day will shut down any club in Atlanta. The published date on the video is 2012, phone camera quality wasn’t the best, but it’s still good enough to watch what transpires. I’m not certain where he’s performing but it’s a packed crowd and a packed stage, all Gucci’s homies are up there with him. If you look into the far left corner, at the seven-second mark, you notice someone is moving through the packed backstage onto the crowd. 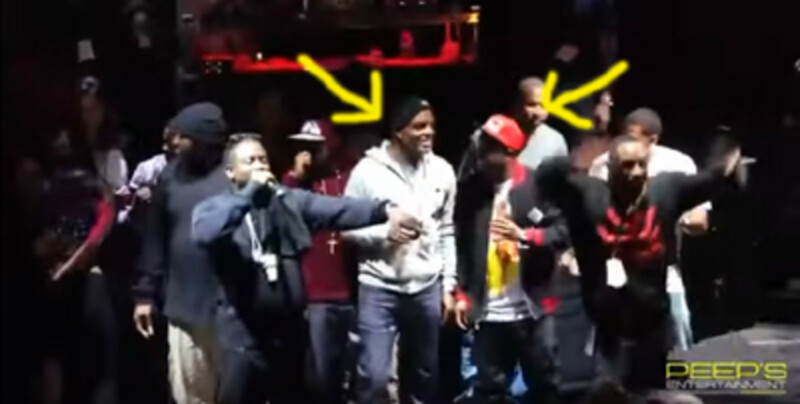 By the 11 second mark the bouncing, energetic man is standing right next to Gucci Mane. Literally close enough to do just about anything. 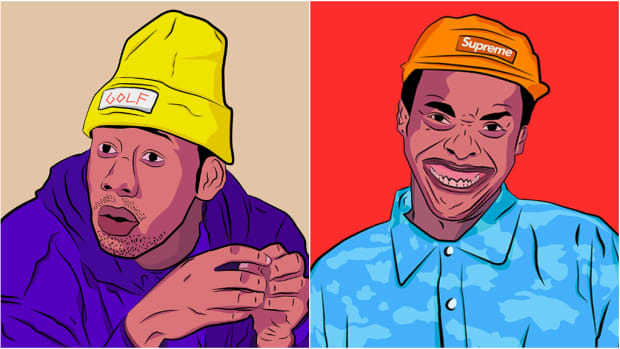 That man is Tyler the Creator because, of course, it is. Like a reflex, his security guard, who is built like a monster truck does not hesitate to yolk up Tyler. As he drags him by the neck to the right side of the stage, notice the man doesn’t look frightened. There’s a moment where he even grins before security can throw him like a bag of bricks the man jumps into the crowd. Gucci looks over at what’s happening but doesn’t stop rapping a single line, this is a true showman. If you only watched it once, you likely missed the best part. 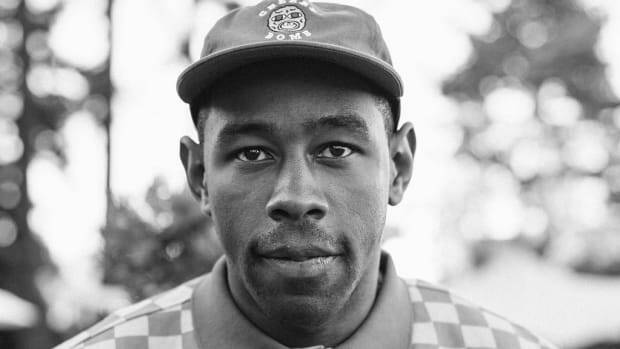 When Tyler rushes the stage, he isn’t alone, there’s another guy with him that doesn’t resemble anyone in Odd Future. 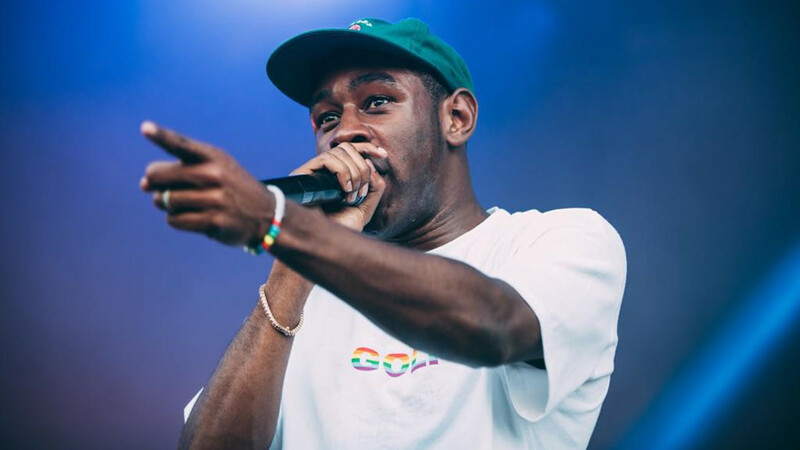 You see him clearly at the 12-second mark, he has on a blue button up shirt and much like Tyler, he’s bouncing, energetic, and completely ready to turn up on stage. You watch him slowly turn down as Tyler is getting dragged away, by the 15-16 second mark he is high tailing it out of there. He wants no parts of this. There’s a guy in a red snapback that’s been on stage the entire time, obviously a member of So Icey. He rushes over to see what is happening—pay attention to Red Hat because he&apos;s actually a pivotal character in our drama. Nothing has been stopped, the music is going, Gucci is rapping. Besides the small group in the corner, it’s like nothing happened. At 28 seconds Red Hat goes back and speaks to someone in the corner area. I don’t know what is said but Tyler is back rushing the stage. This is incredible. 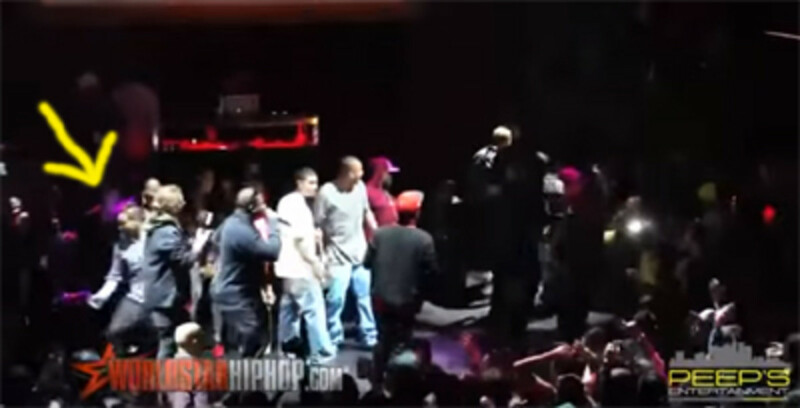 I’ve never seen a person get escorted off the stage in a headlock who so adamantly returns. It’s like getting body slammed by Action Bronson and returning back for more punishment. Tyler is doing Tyler, completely in his zone, watching him dance is like witnessing an adult having a sugar rush while listening to heavy metal. You really get a good look at him. He looks young; this could easily be from before 2012. 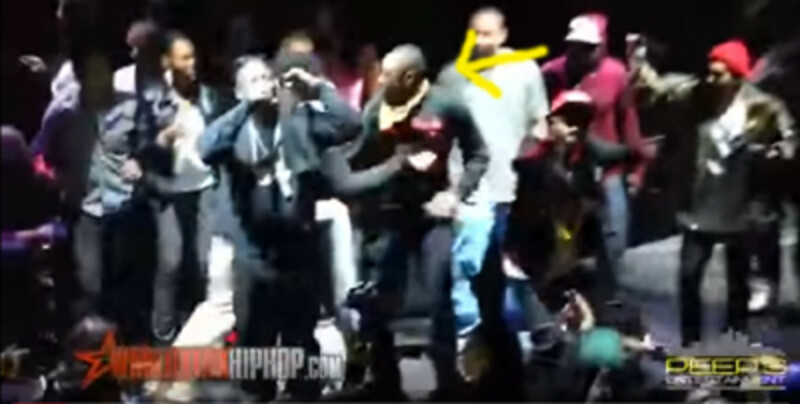 He’s only back on stage for a second before security’s arm blocks him from getting too close to Guwop. You almost think it’s going to be another chokeslam, but Red Hat comes to his rescue. At the 34-second mark, while Tyler is still rocking out, Red Hat is basically telling security that the kid is good. Watch how disappointed security looks at 38-40 seconds, he backs away like a giant puppy who was just trying to protect his owner from the crazy neighbor. He is really just doing his job; got to commend that guy. Now, go back to the 30-second mark. A guy in a white hoodie enters onto the center of the stage. He came on during all the insanity with Tyler. It’s not until around 42 seconds do you realize that it’s Coach K, a man that would later go on to be the label head over at Quality Control. That’s a man who has been deep in Atlanta’s hip-hop scene since the early days of Gucci and Jeezy. Even he&apos;s watching as Tyler dances around. Red Hat must’ve noticed and whispered something to him because, at 47 seconds, you&apos;ll notice he breaks out into an approving grin. Who is the man in the Red Hat? Why is he Tyler’s savior? 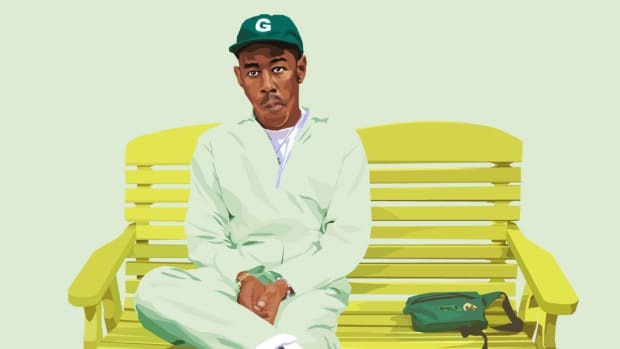 Tyler was relatively known, “Yonkers” had already blown up on the internet, but the guy didn’t even see his face when he was originally rushed off stage. Most stage rushers are annoying fans that are attention seekers, doing it for the Vine. Tyler can be a bit much, too. But noticing his 1017 shirt reminded of this really old, obnoxious video of him riding around turning up to Waka Flocka’s “Oh Lets Do It.” OF were really big advocates of "So Icey" and 1017 early on, so it was cool knowing that this moment randomly transpired. 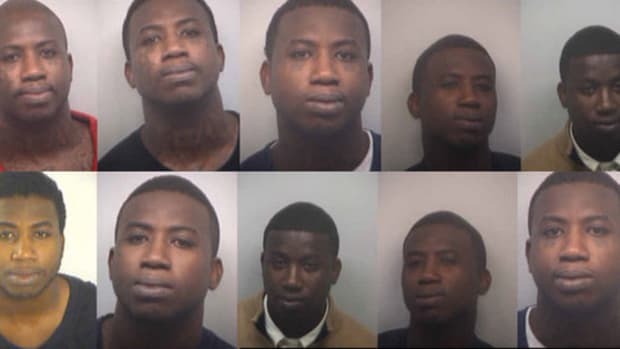 Even after being allowed to lose his mind on stage, Gucci never acknowledges his existence. Actually, no one on stage even attempts to show him any love. Even the guy in the red hat, the man who saved his life, doesn’t even extend his hand for a quick dap to reassure him that he’s good. 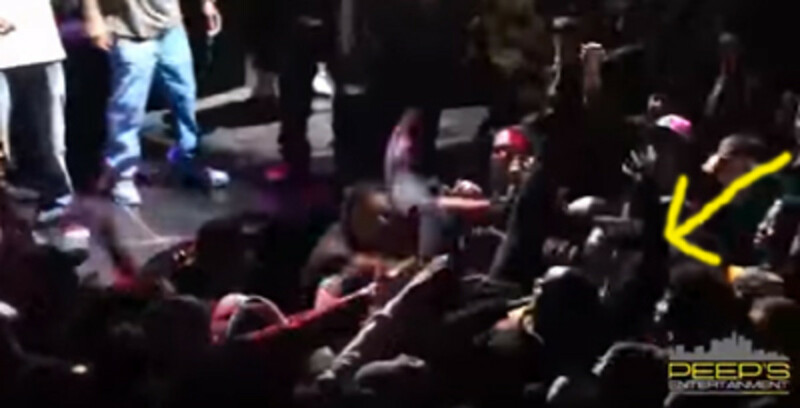 At 58 seconds, Tyler dives off stage, the unsuspecting crowd barely reacts fast enough to hold him up but you notice that when the camera zooms out, everything erupts once he’s in the crowd. They were hyped before but it just reaches a different level once Tyler joins them. The best parts of videos like this aren’t just the guy getting choked by security, but the supporting cast that really gives it character. While the video might be an ancient artifact from years ago, watching it scene by scene, seeing how everyone interacts, how nonchalant Gucci is, how insane Tyler is, it&apos;s all randomly fascinating. 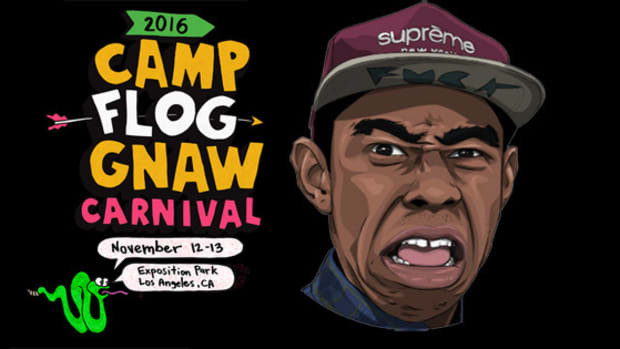 Hopefully, Gucci will be free soon and he and Tyler can rightfully reunite on stage at the next Odd Future Carnival. In the meantime, I&apos;d like to thank the internet for containing such wonders. Who says the internet&apos;s not good for anything but wasting time?